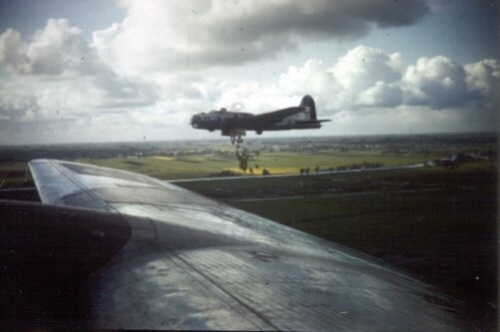 While the sight of big four engine bombers with their bomb bay doors open had previously spread fear and destruction across Fortress Europe, starting May 1, 1945 it meant only manna from heaven was coming to the Dutch people. Facing starvation and in need of immediate assistance while the final details of the surrender of the German forces could be worked out, the Mighty Eighth came to the rescue of the Dutch. The B-17G Flying Fortresses of the 100th Bomb Group dropped tons of food and supplies to the needy of Holland and in doing so, helped save the lives of many. As the children waved and hoped for candy and gum, the mothers and fathers hoped the parcels floating down carried the food they needed to feed their hungry families. Flying a preset course arranged between the Allies and Germans occupying the territory, the Forts came in low and vulnerable (some as low as 200 feet). Even on mercy missions the prospect of mechanical failure at such a low level or overzealous German gunners could not stop losses from happening. Thankfully, the 100th BG did not experience any of these losses, but our sister group, the 95th did. Many who flew these missions will never forget them and recall them being some of the proudest moments they experienced during the war. We open this section with thanks to all those who helped bring HOPE back to a war torn Europe, and to the people of Holland for never forgetting. We also want to thank Jack O’Leary for sharing many items for display here from his archives.